My first experience swimming with dolphins nearly scared me to death. That's because I didn't know they were dolphins. I thought they were sharks. I was a Florida newbie, freshly down from cold Michigan, and swimming in salt water for the first time in my life at Pensacola Beach. Maybe I was trying to impress some girls. That could be why I swam too far offshore. Suddenly the water all around me was alive with large energetic grey animals. If someone had been on the beach that day with a stop watch, I might have made the Olympics. It didn't take me more than a couple of dozen seconds to make it back to the beach. The laughter from the beach crowd still rings in my ears. I was very relieved to learn that I had been swimming with dolphins, not sharks. Then along came the old "Flipper" television series, and we all fell in love with the lovable little guy. Ivan Tors produced that series along with "Sea Hunt" starring Lloyd Bridges. 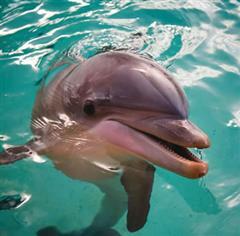 Both series were filmed at well known Florida tourist attractions Miami Seaquarium and Silver Springs. Flipper made all of us want to become friends with dolphins. In the years since then I have seen many dolphins in Florida and The Bahamas in their natural element, the ocean. I love it when they cavort in my bow wave or follow behind in my wake. My kids even tolerated my belief that I could attract dolphins to our sailboat by tapping my ring on the metal steering wheel. Years ago I was sailing with a marine biologist friend south of Vero Beach, Florida. We saw a tragic site in the Intracoastal waterway: a female dolphin slowly pushing its dead baby toward an island. She left her dead youngster on the beach, but swam slowly back and forth before finally leaving. It was then I began to understand that dolphins were more than just friendly fish. They were intelligent mammals and sentient beings. Dr. John C. Lilly wrote an interesting book titled "The Mind Of The Dolphin", and presented further evidence on the dolphin's intelligence. He even taught them a rudimentary language. I sailed to the Florida Keys a few years ago with one of my sons. We discovered Hawks Cay Resort. It is on Duck Key, just north of Marathon in the Middle Florida Keys. We spent a couple of days there in the Hawk's Cay marina. We saw many people swimming with dolphins on our visit and realized it had become one of the most popular Florida tourist attractions in the Keys. The Dolphin Connection is located at Hawk's Cay Resort. The Dolphin Connection was founded in 1996 by Cheryl and Doug Messinger, leaders in the training and care of marine mammals. It is centered around a beautiful saltwater lagoon. The crystal clear waters of the Florida Keys provide the backdrop. You are close enough to enjoy the beauty of the Florida Keys with the dolphins as your guide. That may be what they were trying to do for me those many years ago at Pensacola Beach. There are many programs at The Dolphin Connection that will allow you to swim with dolphins. The dolphins that live here are bottle-nosed dolphins. Guests can get up close and personal with these dolphins. Swimming with dolphins is about as close as you can get. Many different packages are available for a fun and exciting adventure when you visit to The Dolphin Connection. Adults have as much fun as the kids. Some of the programs, such as Dockside Dolphins (no swimming with dolphins; you sit on the dock and pet the dolphins for 30 minutes), are as low as $ 60. All programs require a reservation. Call 1-888-814-9154 for reservations, or visit the website of The Dolphin Connection to learn more about swimming with dolphins. Call 1-888-814-9154 for operating hours. The Dolphin Connection is about halfway between Key Largo and Key West. Take US-1 (The Overseas Highway) to Duck Key and the Hawk's Cay Resort at about Mile Marker 61. When I visit The Dolphin Connection I like to stay at the beautiful Hawk's Cay Resort.